Courtesy of Detroit free press. “Bohemian Rhapsody,” (2018) a Queen biopic that pays tribute to classic rock star Freddie Mercury hit theaters Nov. 2. The film is a celebration of the life and music Mercury gifted to the world. Mercury is played by Rami Malek, drummer Roger Taylor is played by Ben Hardy, bassist John Deacon is played by Joseph Mazzello, and guitarist Brian May is played by Gwilym Lee. Malek gives fans the performance of a lifetime as he completely embodies Mercury’s essence. Malek perfectly demonstrates how lively and energetic Mercury’s stage presence was with jolts and jumps on stage. Malek gives off a strong energy and director Bryan Singer captures it by setting the scene and capturing the magic Malek bleeds on stage with creative camera angles and lighting. Singer focused on the musical aspect of Queen’s journey while also drawing attention to Mercury’s internal and external struggles, such as alcohol and drug abuse, sexuality identity, mental health, marriage issues and AIDS, with which Mercury was diagnosed. These struggles are important to Mercury’s narrative but the focal point of the biopic is to portray, the musical journey of all four Queen members. The film follows the rise and success of Queen and the impact it had on music in the late ‘70s to early ‘80s. Queen ran in the same musical race as Elton John, David Bowie and Bob Dylan, but the team of four combated radio hits and social norms with challenging music videos and genre-bending tracks. 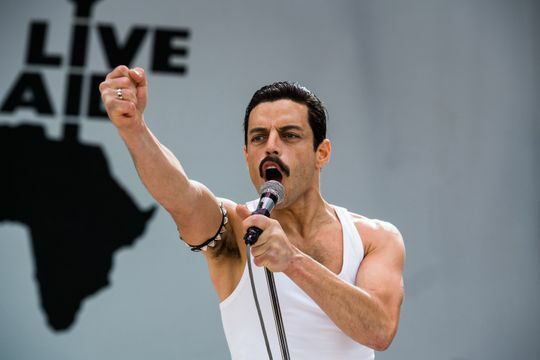 A large portion of the film focuses on the movie’s namesake single, “Bohemian Rhapsody,” from the 1975 album “A Night at the Opera.” Singer highlights the negative critiques of the six-minute single and how fans disproved every negative comment. Actors Hardy and Mazzello, who doubled as the film’s producers, portray the band as a united front when it came to conflicts with music producers or unsatisfied audiences. The film gives insight into how the band wrote some of its biggest hits and illuminated the process of each track. Throughout the film, Malek portrayed Mercury as flighty yet determined, talented yet unconventional and surprising at every turn. For the majority of the storyline, the other three members continue to support their lead singer despite frustrations and conflicts. “Bohemian Rhapsody” is a captivating tale that creates an undeniable empathy for the main character and rebirths a love for the famous rock ‘n’ roll band that broke stereotypes and redefined music in the ’80s. The legacy lives on.